Valves are small, narrow and linear, with subrostrate ends. The axial area is narrow. The stauros is bow-tie shaped, commonly with areola present at the valve margins. The raphe is filiform and straight, with weakly inflated proximal ends and unilaterally curved distal ends. 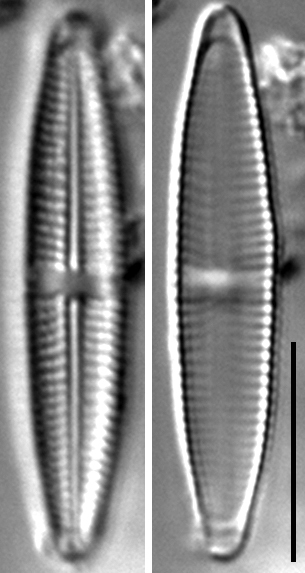 Striae are weakly radiate near the valve center, numbering 18-20 in 10 µm. 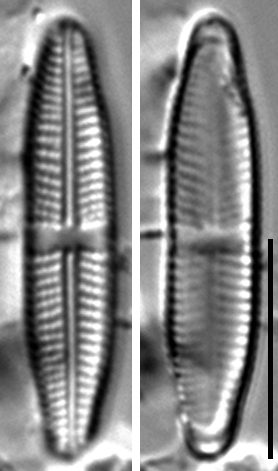 Striae are weakly radiate to parallel at the apices, numbering 20-22 in 10 µm. 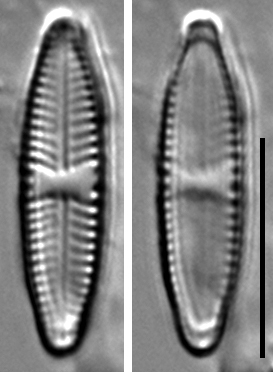 The striae are composed of areolae numbering 27-29 in 10 µm. Pseudosepta are present. Stauroneis bovbjergii is a taxon only reported from the Excelsior Fen-complex located on the Dugout Creek Wildlife Management Area, Dickinson County, Iowa (Reimer 1990). 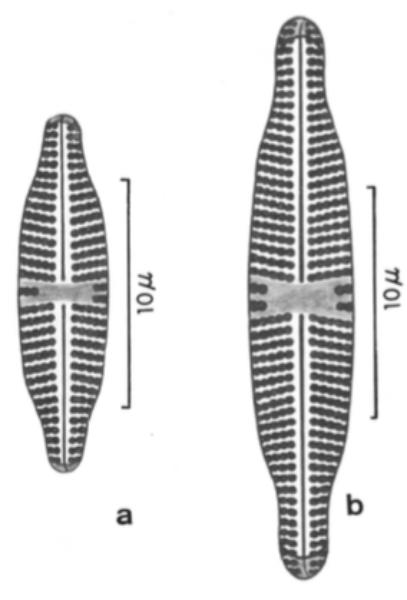 The Excelsior Fen-complex is an alkali fen, influenced by row-crop agriculture (Reimer 1982) . Ecology and Systematics of Diatoms course students sampling algal mats at Excelsior Fen. Valve linear with slightly convex margins and protracted sub-rostrate to rostrate ends. 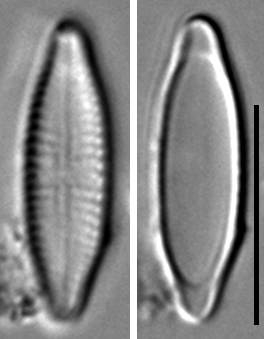 Stauros across valve center and a pseudosepum at each apex. Axial area narrow linear. Central area quadrangular with one or two short striae at the margins. Raphe filiform; proximal raphe ends blunt, distal ends curved slightly in the same direction. Striae radiate becoming mostly parallel, sometimes slightly convergent, at the ends; indistinctly punctate. Length 14-25 um. Width 4-4.5 um. Striae 18-20 in 10 um becoming ca. 22 in the 10 um at ends. Puncta ca. 25-27 in 10 um. Holotype: ILL #SP 7. Iowa, Dickinson Co., Excelsior Fen # 11. 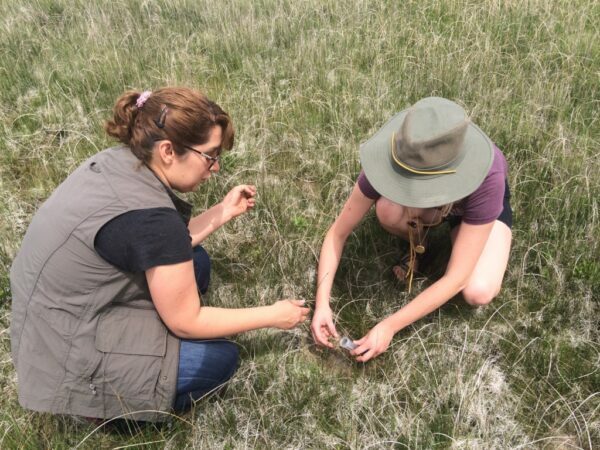 "S. edge of S. knob; in Scirpus shade on moss." Coll: R.L. Mitchem, July 25, 1972. Reimer, C.W. 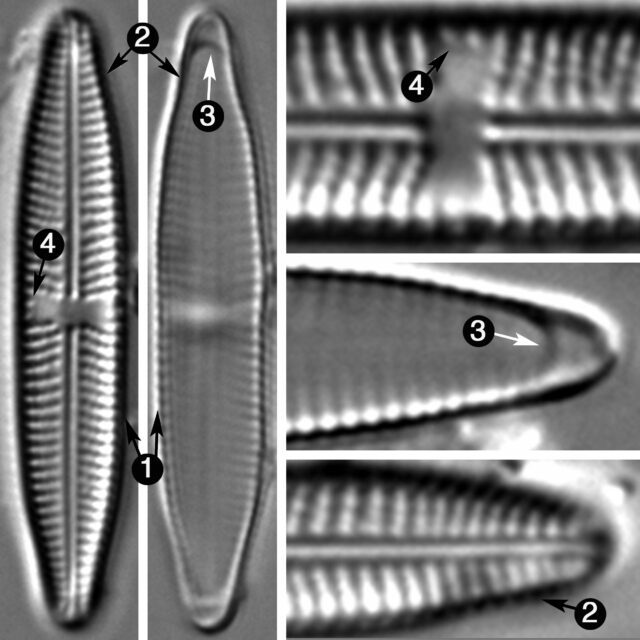 (1990) Diatoms (Bacillariophyceae) from the Excelsior Fen-complex, Dickinson Co., Iowa, with the description of two new taxa. Journal of the Iowa Academy of Science 97(4):146-152. Valves are small, and narrow, with sub-rostrate apices. 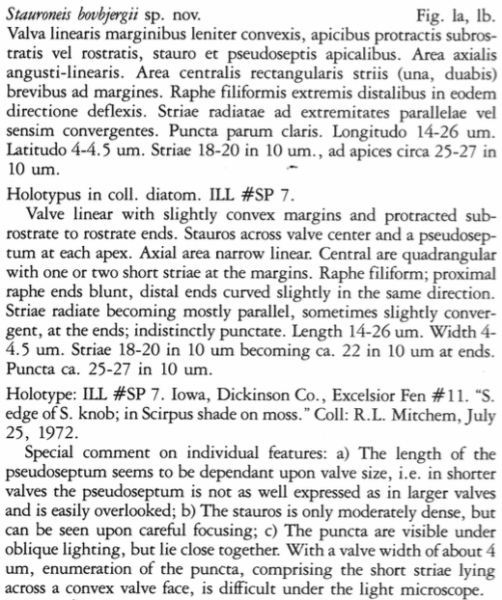 Pseudosepta are present. Areolae are usually present along the margin of the valve, at the stauros.